A few days ago I was watching The Newlyweds Game (I was killing time, waiting for K to come pick me up… I don’t normally watch The Newlyweds Game) and every time Sherri Shepherd asked the contestants a question I thought to myself, ‘What would K’s answer be? Could we win this game?’. I decided that we probably wouldn’t win it, but we wouldn’t be the losing couple either. This is a picture of the wedding aftermath. I love this photo. I’m really happy with all the generous gifts we received… I just enjoyed the registering part 🙂 I love picking out kitchen appliances and dishware. We registered at Bed, Bath, & Beyond, Amazon, and Sears… so in hindsight I’d have switched Crate & Barrel for Sears. And maybe not registered for the ice cream maker (which we got!!). This is probably the only thing I’d really, truly go back & change. We hired a guy last minute from a large company in Cleveland and he cost way too much money, didn’t capture all the moments, and totally didn’t do the family interviews. He was a turd. 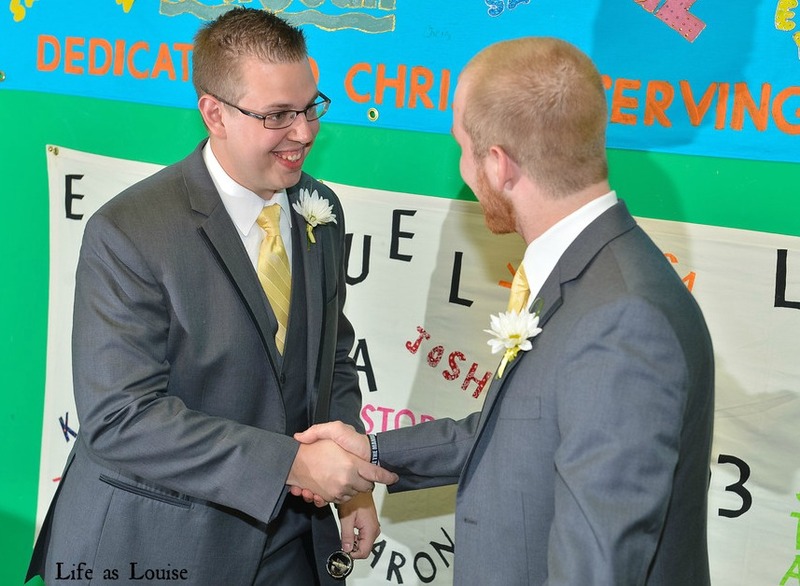 Although I got this funny forced picture of K and our best man awkwardly shaking hands for the camera. I think most brides & grooms look back and think, “So-and-so didn’t need to be invited, but we definitely should’ve included so-and-so.” That happened to us. With my baby brother’s nuptials coming fast in July I tried to warn him about this. 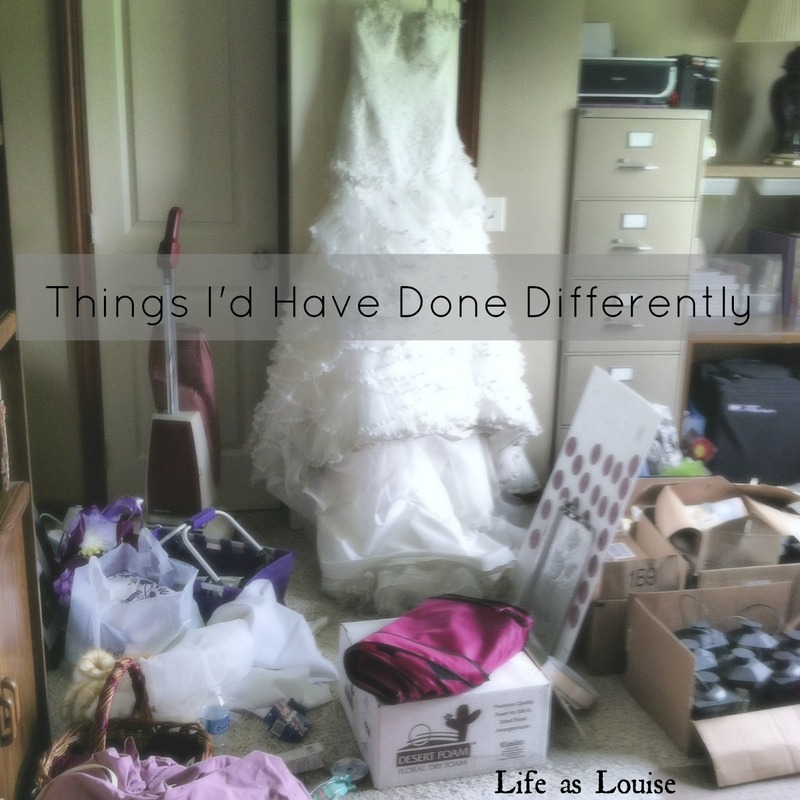 While I do not think I was a bridezilla, I will admit that I was a control freak. I demanded to be kept in the loop on my bridal shower details and I wasn’t great at delegating tasks. I definitely could’ve taken a chill pill because my maid of honor & 5 other bridesmaids had everything covered. I wish Lylee-bear could’ve been at the wedding. K and I had our first dance to Keith Urban’s “Your Everything.” I love this song, especially now, but our song is actually “I’ll Be” by Edwin McCain. We decided not to dance to that one because a lot of people use it and we wanted our first dance song to be unique. Well, my best friend Erica knew all that so at the end of the night she requested “I’ll Be” and I was so shocked to hear it and I cried when it came on. (I’m close to crying right now thinking about it. ) So we got to end the night dancing to our song. Really, I’d change nothing about our wedding day. It was perfection. What about you? Any trivial details you’d go back to your wedding or first date and alter if you could? I totally understand why that bugs you. My biggest beef with our videographer was that he missed our kiss! I was SO upset when I watch the playback. Just ridiculous! I tell all my brides – you will ALWAYS find something that isn’t perfect – but that’s what makes a wedding day memorable. & hold up – what station is the Newlywed game on? I loved the OLD show… I need to see this with Sherri Shepherd – I LOVE HER! I think the Game Show Network had a marathon last Saturday! Haha! It’s definitely entertaining! I talked to K about my list and he agreed, but it was such a perfect day that I really had to rack my brain to come up with five solid things! Haha! oh GREAT post idea – i may have to use this too! the big thing for me would be to NOT have a seating chart. it ended up that someone switched the table numbers and some of ravery’s family sat in the back and then cause a whole lot of unnecessary drama later instead of letting us know at the time. it caused some strife in a few relationships with his family members and me so NO seating chart! Oh no! I’m so sorry that a silly ol’ seating chart cause so much drama! I could NEVER have scrapped the seating chart, but my whole “be less controlling” would’ve saved me some drama after the whole thing was over. My maid of honor had some sore feelings after all was said and done. I don’t think I’ve ever seen The Newlywed Game, but I’m curious if we would get any questions right, too. We had a courthouse wedding and I loved it. The only thing I’d change is making it so they didn’t only have them on Wednesdays so my mom could have come! Some of the questions they ask are really weird like, “If your wife was a fruit what would she be?” I asked my husband that and he said plum. Hahaha. I can’t remember why that was his answer. Your wedding sounds like it was just right!! I’m sorry your mom couldn’t be there! How silly that they only have weddings on one day! I had no idea! Well, now I would’ve had only my dad walk me down the aisle/dance with my and not my “father.” But, I probably would’ve stood up to the crazy church lady and made it so our moms could’ve signed our marriage license instead of one of the two best men and one of the two maids of honor. That lady was crazy. Crazy wedding people are the WORST! Our reception venue was gorgeous and everything turned out just like I imagined, but the guy who owned the venue was a TOTAL psychopath! Ugh! I HATED dealing with him!! Haha! The videographer sounds like a real disappointment! Mannn, I’m over it now. But I was SO MAD when I got the final DVD from them. Grrr! Oh well, my memory is pretty awesome so I’ll just replay the good images in my head! Haha! That was such a lovely gesture for Erica to ask for I’ll Be. I’ve been a part of A LOT of weddings. Big, small, outrageous, under-stated…and you know what worked best for me? Going to the registry office (same as justice of the peace) and meeting people at the pub after on a Sunday afternoon. My dress cost $65. Ha. That kind of wedding sounds SO drama-free! There were so many moments I told K that we were going to elope. I actually made him promise that when it did come to that (because my sanity was wearing thin thanks to my type-A psycho brain) he would refuse to marry me via elopement. Haha! I had fun planning the wedding but every so often all I could think was, ‘Screw this.’ Hahaha! I love that you wouldn’t change much – it proves it was just right! It definitely was just right 🙂 I checked with my husband before I posted this to make sure I wasn’t going to blindside him and he laughed at the trivial things I’d come up with 🙂 It was a really, really great day.